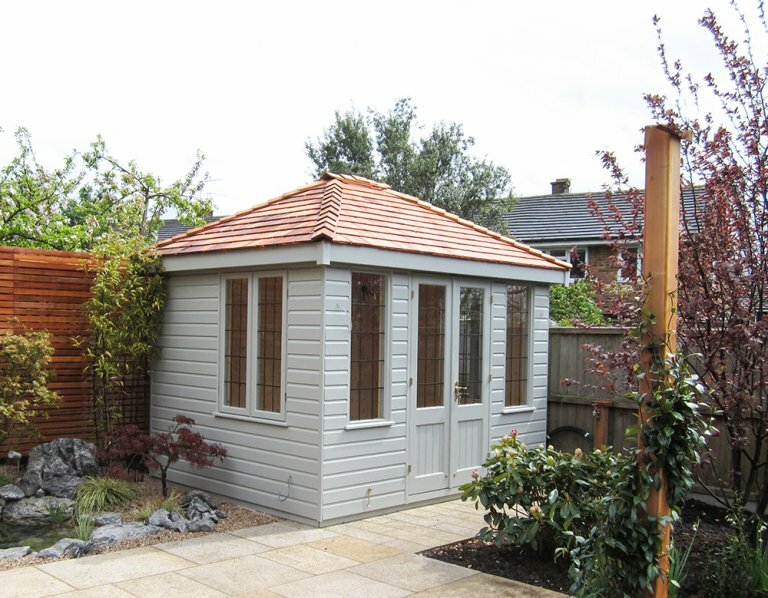 This 2.4 x 3.0m Cley Summerhouse has been installed in our customer’s garden in Hove, East Sussex for use as a home office. Delivery and installation is included in the price as part of our end-to-end service. One distinct feature of this Summerhouse is the cedar shingle tiles on the hipped roof, as these are terracotta in colour initially, and they will silver with age (after around 6 months). 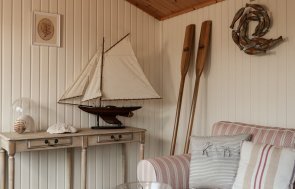 The shiplap cladding is painted in Pebble from our Valtti Paint System for a neutral colour that will blend in with the surrounding garden. Our customer can work comfortably in their summerhouse all year round thanks to the insulated ceiling and walls, as well as the electric pack. Natural matchboard lining on the walls and ceiling will also help to create a warm, homely atmosphere inside. The addition of multiple windows with a traditional leaded design situated around the build allows for natural light to enter the work space throughout the day, from all angles. It also means the customer always has a view of the garden whilst at work. The Cley Summerhouse is a traditionally styled building, but if you would like something more modern, please have a look at the rest of our range of Summerhouses, or our Garden Studios for inspiration. 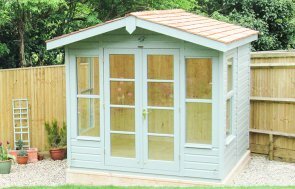 We have a wide selection of Garden Buildings for you to choose from, all of which you can to view at one of our UK Show Centres. If you have any questions you can Contact Us or call us directly on 01760 444 229.